I celebrated Mother's Day with my mom and mother-in-law last weekend. They were both in town visiting, so it was perfect timing to share the weekend and celebrate together. I got them what most of us are craving these days, Kendra Scott jewelry; necklaces to be exact. 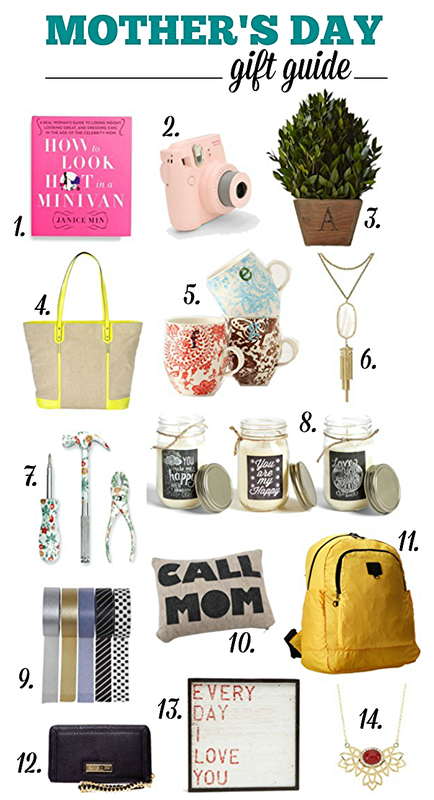 Even though my shopping is complete, I thought I would share a few fun finds if you are last minute shopping or stumped finding a unique gift for the moms in your life. Every item listed below is $100 or less (except for the tassel necklace). P.S. Hey honey, if you are reading today, the pink Fujifilm Instax Mini camera and I would make great friends. Just saying. I was thinking a tool kit for my Mom. The floral is adorable! That bag is a great idea! My sister and I got my mom a new pair of pj's, a ring from Charming Charlies (who can go wrong with charming charlies?!) and a phone case :) I hope you get some great stuff too! I think the printed tool set is so fun! Fun round up! You know I'm newly obsessed with the Kendra Scott necklace, and I love that topiary and that tote! These are awesome gift options! I am especially loving number 13 - how sweet. I could see that in the middle of a gallery wall full of pictures of me and my sweet girl. That's it, I'm buying it. Those mugs are pretty darn cute! I ordered a photo book from shutterfly for my mom and mother in law. And I had the boys make pictures for them too. I like the subtle hint to the mister - well played. I love those mason jar candles. Love the Anthro mugs of course. Such a great roundup! I love that little topiary with the initial on the box! Super cute! These are all such great picks! I love the mason jar candles and the myrtle box! Great list! The minivan book is hilarious;) I can always be made extremely happy with jewelry (that I email the link to my husband for.) Winning! i desperately need a gift for my mom! i love the camera idea! I really want to buy that cute little camera for myself. how cute are those floral tools!! i love them! Number 2 is definitely on my list!! Great picks! Love the call mom pillow- although that is already the number one answer in my house!